The United States Military has spent a lot of time and money developing its Special Operations forces. These elite teams of security operatives are highly trained to shoot, move and communicate under duress, with little or no advance notice of their impending scenario. Most missions involve dynamic entry, assessment and neutralization of threats, all while achieving a primary objective. 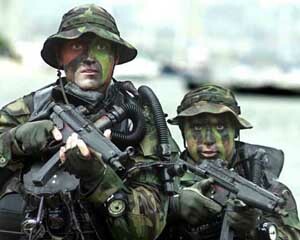 Seal Team 6 is the most famous of all the Special Operations teams. These are the operatives that led the capture and termination of Osama bin Laden, the maritime rescue of American sailors on the Maersk and the recent recovery of foreign journalists held hostage by Al-Shabaab terrorists. The best of the best has handled the worst of the worst. Imagine what you could get done if you had your own Seal Team 6. On the surface, this legendary team appears to have accomplished near-mythical tasks. Once you start to break their missions and objectives down into their most basic milestones, actions and counteractions, however, their methods become much simpler. Like Seal Team 6, cybersecurity has become a household word and responding to security incidents has become a common occurrence. Intellectual property, sensitive data and bank accounts have never been more at risk, and detecting, containing and correcting security incidents requires planning, practice and grace under pressure. Once developed, your Computer Incident Response Team (CIRT), Special Operations Team (SOT) or whatever you call it (just don’t call it Seal Team 7, that’s taken) will give your organization a “force multiplier”. Force multipliers are assets that give your organization a strategic advantage and increase the effectiveness and efficiency of overall operations. These assets, or teams multiply the force of your organization because they carry out tasks that would normally require much greater resources to accomplish. This is possible due to the highly trained and focused nature of the team. And yes, you can have your own. Find the right operatives – Incident responders are born, not made. This isn’t completely true, but it takes a certain mindset and attitude to gain situational awareness, remain calm and lead when an organization is under attack. These skills are tough to teach. You probably already know who your operatives are. If you don’t, stop here and look for a qualified security provider that already delivers Incident Response services. Select the right weapons – A good shooter can make a bad gun shoot well. You don’t need the most expensive security tools, but you do need to make what you’ve got work effectively. If you’re about to embark on a digital forensics mission, you better have the right tool in your bag. And carry a backup. Your tools should meet their requirements and work consistently. The basics – Every Navy Seal is required to qualify with a rifle every year, regardless of his or her rank. It’s part of being a Seal. The ability to shoot, move and communicate makes our Military the greatest on Earth. Your CIRT resources should understand the basics of threat modeling, analysis, communication and tool manipulation. No exceptions. Scenario drills – Your training should incorporate regular attack and counterattack simulations – these should be as real as possible. Good penetration testing is critical, but tabletop exercises and other drills are important parts of the program. Training should incorporate “unplanned” scenarios, performance assessments and any analysis that will help the team perform during a real situation. Bugout – Training should include handling worst-case scenarios, or what the Military calls SHTF. When things really get sideways, you need to know what to do, when to do it and who’s going to do it. Crisis Management should integrate with your Incident Response Plan. Regardless of what industry you’re in or what size your company is, at some point you will become a statistic (if you haven’t already). A Special Operations team specifically trained and ready to handle incidents could mean the difference between an achieved objective and a botched mission. You may not be hunting terrorists or saving foreign diplomats, but your CEO might just give you a Medal of Honor.